This image has recently come under considerable criticism on social media for dangerous mountaineering practices. The location is unknown as the qualified mountain guide observer wanted to maintain the climbers' anonymity. What specifically is wrong with the technique being applied in this image and what risks does it pose? What should the group have been doing to ascend more safely? This is slow but very safe. You do it in steep and/or difficult terrain. Is typically done on glacier hikes where the main risk is falling into a crevasse. If there is no risk of crevasses, this can only make sense if you walk e.g. 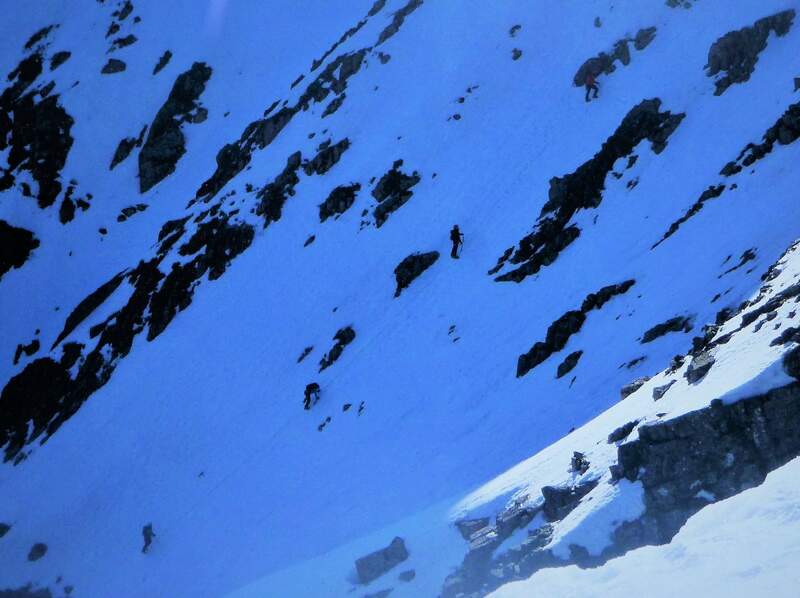 on a snow ridge where you have no possibility to use protection: In case one falls, the roped-in friend has to react very fast and jump on the other side of the ridge. This is very difficult and therefore needs experience. I was told this should only be done by mountain guides going behind the client. No backups. You have to feel absolutely comfortable with the terrain you are moving in. For me it looks very unlikely to have hidden crevasses in the terrain seen in the picture. So for option (3) it is much more likely that the roping together introduces a much higher risk here than going without rope. Especially if you tie in 5 people (!) it is not very likely that the members will hold the party if somebody falls. It will be more like a chain reaction with very fatal consequences, not only for the one who falls, but for the whole party. I once was guided in South America on rocky terrain in a five-member party without using protection. For me this is similarly a no-go but the guide said it's OK and he does it all the time. For me this is not the way to move in the mountains, but opinions differ. I say you use one of the options (1), (2) or (4) depending on how comfortable you feel in respect to the experience and skill level of all (!) members of the party. If you can't find a conclusion the way to react is: don't ascend further - return to a route which is safer for your group. For me it seems that the wall is not that steep so that option (1) is too slow. Especially if you only have 1 rope for 5 people. So I would either search for spots to use mobile protection to place a camelot or nut. Or I would try to find rocks to guide the rope properly - descriped in (2). The only good alternative for me is that everybody feels safe and all are moving unroped (4). If the snow was hard packed enough that a self arrest is not possible, and there are no intermediate anchors, then if one person falls, they can take the whole team down with them. If that was the case then what they should have done is to have the first person place anchors as they went up, either snow pickets or ice screws depending on the conditions. The anchors are clipped to the rope and passed by each climber in turn. The last person in the group picks them up as they go, and when the leader is almost out of pieces, they create a bombproof anchor, bring the entire team up to it and get the pieces from the last person. Its identical to simuling while rock climbing, just on snow/ice. Beyond that, I am not certain of what else they could have done, other than not being there. It is possible that a different time of day would have made for better conditions, but that is hard to say from the image. It look like they are "moving together". Very common in alpine ascents when moving over easier ground where it would take too long to pitch the climb (fixed belay). The leader would run out around 10-20 meters to the second and would look for rock features or quick placements to get some protection in. Notice the rock features on the ascent, I'm guessing there would be placements there. If the leader or the second falls they will counter one another arresting the fall. It's a good system if worked correctly and it looks like the climbers in the photo are doing everything they should given the angle and general conditions. You can move quickly and relatively safely on easier ground using this system and you don't have to stop to place a fixed belay unless the climb needs to be pitched. I have climbed like this on ice and on easy rock. It's impossible to say from a photograph whether something is "safe" or not. Many factors come into play, including the experience level of the climbers concerned. For all we know, they may have been roped together for a glacier traverse, and chosen to stay roped up for a short section well within their capabilities, knowing they will need to be protected again later. It's easy to forget that unroping takes time, which can be a risk in itself; in mountaineering, one needs to be aware that the activity involves being aware of and trading off different risks all of the time. The party is roped up with lots of rope between climbers without any protection in a steep slope of mixed snow and rock. This is never a good mode of ascent as it highly increases the risk. Lets define a "death rate" as probability of an event times amount of casualties resulting from that event. For simplicity every climber has a 1% chance of falling. When soloing the total risk of the 4 climber party is thus 4 climbers * 1% fall chance * 1 death = 4% death rate. If they are roped up, the risk is 4 climbers * 1% fall chance * 4 deaths = 16% death rate. It increased 4 times (in general by the amount of climbers in the party). Ascending roped without protection is done with a taut rope very close to each other. Even in that configuration it is hard to arrest a fall, the idea is more to prohibit a fall when the second stumbles. On a long rope with (inevitable) slack it is impossible. The only slim hope is, that while falling down the rope entangles itself in a rock... Every year in the mountaineering accident statistics of my country (tiny Switzerland) there is a few casualties from so called "Mitreissunfälle" (literally carry along accident) - so this is not theory, it happens. There are several options that all have their place depending on the climbers and conditions: Short-rope, running belay (long rope with protection in between), fixed belays or soloing. Of course there is the case of crevasse terrain with intermediate steep section where one is inclined to keep going on long rope without protection to save time. This is however just a pretext and should not be done unless you are under serious time constraint and every one in the party understands the risk. Rather invest some minutes to unrope or put in some (few) protections on a running belay than pulling/being pulled to death with your friends. Looks like a team arrest setup. I've seen it in the books but never had a case to use it. The idea is when a single ax self arrest won't hold all of the axes might. With 5 people the math starts looking good. Icy snow like what I see here holds crampons and force-driven axes very well. Ok I'm the guy famous here for climbing with an ax for which self arrest doesn't work because we were climbing into area where boot ax belay was mandatory anyway, so maybe my evaluations aren't quite right, but here goes: On this slope, the only thing that makes it look to me like they're out of range is the weight of their packs. If one of them slips and falls, there's a chance the others won't be able to save their comrade from falling and will be dragged down as well. ROME - Yesterday morning, a Dutch woman saw her husband and three children fall into a ravine during a climb on the Mont Dolent, part of the Mont Blanc Massif. The family had set out in the early morning from a cabin at 2600 meters. Mother Ada stopped at a lower glacier, after which the father and their three children continued the ascent which isn't known as extremely difficult to climbers. After having reached the summit and having started the descent, after about 200 meters one of them supposedly slipped and dragged the other three in the fall. The four where connected with ropes. This system helps less experienced climbers, but can, as it was yesterday, be fatal to the whole group. Not the answer you're looking for? Browse other questions tagged safety mountaineering ropes mountains ice or ask your own question. What do classifications of belays (like “4th class belay”) mean? Is rope-soloing inherently dangerous, and if so, why?